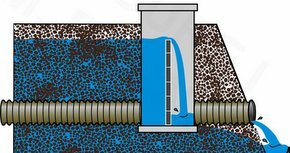 Drainage water management is the practice of using a water control structure to raise the drainage outlet to various depths. This allows farmers to have more control over drainage. The drainage system can be designed to reduce nitrate losses by using shallower drains, wider spacing, and two stages within the ditch to increase nutrient trapping and processing.